Drawing from her filmmaking background, Supercoffee owner Cassandra Nicolaou treats her business like an ongoing production, constantly striving to find new ways to engage customers. Digital media has played a major role. 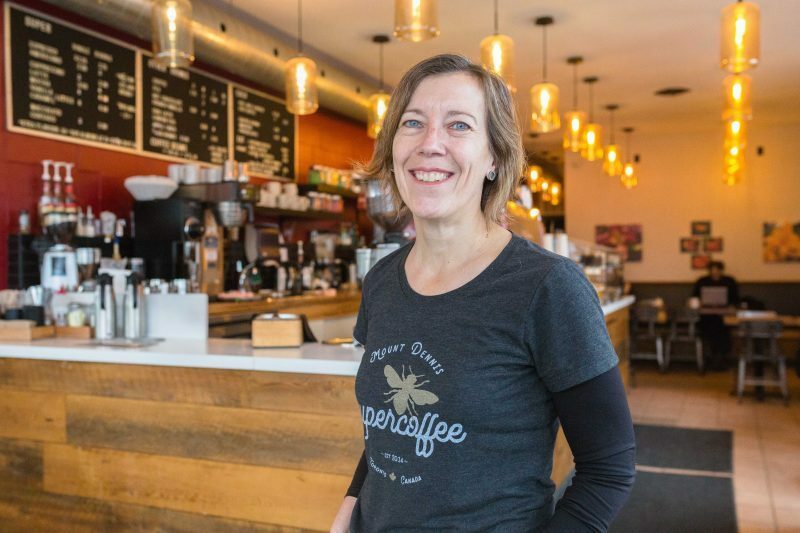 In Toronto’s Mount Dennis neighbourhood Supercoffee has found an unlikely clientele: travellers from Pearson airport. The coffee shop, perched at the apex of Weston Rd. and Eglinton Ave., has become a stopover for visitors on their way downtown. She credits her online presence on sites like TripAdvisor and Yelp with helping to draw clients who wouldn’t otherwise be in the area. It’s a challenge Nicolaou knew she’d have to face when she opened Supercoffee in May 2014. The neighbourhood was hit hard by the closure of Kodak in the mid-2000s, and after Nicolaou’s father set the location aside and moved north, opening Superburger just outside of Shelburne, On., the corner saw a string of unsuccessful businesses failing to survive in the transitioning neighbourhood. Then her dad approached her with an idea. Nicolaou’s always clung to the theory that small businesses thrive on the passion of their owners. If the entrepreneur isn’t around, eventually, it starts to show. Containing that passion and keeping it apparent in her day-to-day has leaned on the coffee shop’s digital presence. She says she can see the “ennui” in a customer’s face when they walk in to see the same old croissants. The same thing goes for social media, you’ve got to keep it fresh, says the Supercoffee founder. Tapping into the middle-aged demographic has proven more challenging. But she’s found new value in things like Trip Advisor and Yelp, where out-of-towners are more likely to look for coffee shops. Through Digital Main Street, Nicolaou was able to connect with a Google-certified photographer to take both exterior and interior photos for Google Maps. It’s helped to boost the businesses profile, something that brings even more diversity to the neighbourhood.